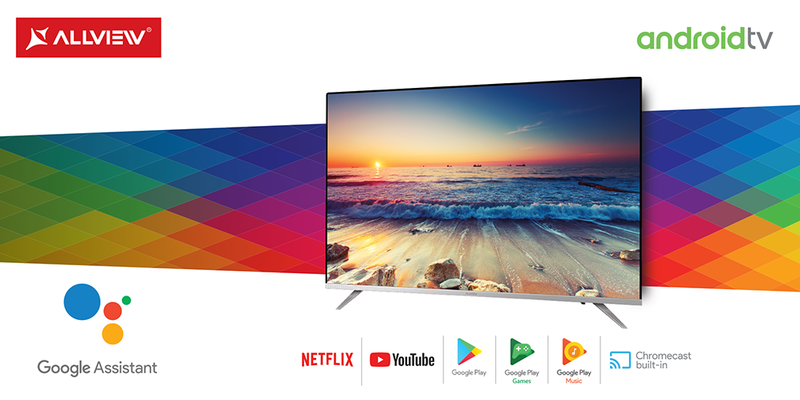 26.11.2018 - After entering the TV market in October, the Romanian brand Allview announces the signing of the contract with Google™ to launch its own brand of Android smart TVs. Closing the deal is a recognition from Google for Allview in terms of the capacity that the local brand demonstrated in Android integration on several product types. Allview therefore announces that from December, it will be selling smart TVs with Android TV and integrated Google Assistant, becoming the only brand in Europe that also has a signed contract with Google in this regard. "We are permanently seeking to offer advanced technology at affordable prices. Android smart TVs will change the perspective of users, giving them the content and apps they choose into menus specifically organized to be highly accessible. The users will get Netflix installed, certified, and available from the first second of running, alongside YouTube and Google Play Games.”, stated Lucian Peticila, General Manager Allview. At this time, only 60 TV models around the world are certified by Google, and some of them have been developed by the Allview brand. Allview's decision to become a player on the Android smart TV market is part of a broader strategy, aiming to become the European brand with the largest number of certified Google TVs in 2019. * Google, Android, Google Play and other brands are trademarks of Google LLC. Created in 2004, Allview brand is present on the IT&C markets from Romania, Poland, Bulgaria, Germany, Spain, Hungary, The Netherlands, Moldavia, Serbia, Montenegro, Macedonia, Bosnia and Herzegovina, Czech Republic, Malta, Cyprus, Greece, Lithuania, Slovenia, Latvia and Estonia. Allview devices have a user-friendly interface, an attractive design, the latest technical features and high performance.